Ants in Slab Homes - AllPest Exterminating, Inc. Ants in Slab Homes - AllPest Exterminating, Inc.
Ants that are found in slab homes are typically called “pavement ants”. This is actually a broad group of ants that are known to nest in the ground. In most instances, these ants are found in the northern and the eastern regions in the United States. 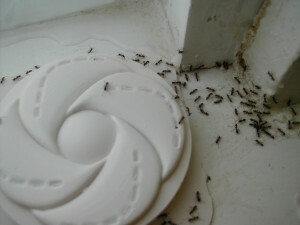 Ants in slab homes live in colonies and have a social structure among their colony. The structure consists of the castes of kings, queens, and workers. These insects may vary as far as color is concerned and are typically either a reddish-brown or blackish-brown color. They may be ¼ of an inch in length or smaller. Ants in slab homes will eat just about anything that they are able to find. Examples of foods that they are known to consume include sweets, meats, starches, fruits, vegetables, and greases. These types of ants depend heavily on moisture and will travel any distance to find it. If you live in a slab home, you should continue reading for important information about pavement ants. In order to eliminate ants in slab homes, it is important that you understand their nesting behaviors. You must know where these insects nest in order to get rid of any infestations that may plague you. These ants most commonly nest in outdoor areas in the ground. They prefer areas that include sidewalks, driveways, building foundations, and other areas where pavement exists. Unfortunately, these pests are known to find their way inside of structures and become a nuisance. The purpose and intent of their lives surround the fact that they require warmth, some level of moisture, and food in order for their colony to grow. When an infestation has occurred, it means that the ants in slab homes have found all of these items and feel as if the region they have settled will be optimal for the growth of their colony. It is at this point, that you will need to consider eliminating the insects.